Attendee evaluation feedback is critical to every event. It gives you insight into what parts went well, what needs to improve, and most importantly… how to keep people coming back. Unfortunately, collecting this feedback is one of the biggest pain points that organizations and planners face. This is the reason why we added Session Evaluations to Conferences i/o. It wasn’t an original feature in the product but we heard so much demand for it from our customers that we decided it build it. The problem with post-event emails is that response rates are generally very low. People are busy, and it’s hard enough to get them to open an email , let alone take the time to fill out a survey — according to MailChimp the industry average open rate is just 16% . You also face the problem of delayed memory recall, so the feedback you do receive may not even be entirely accurate. Distributing, collecting, and organizing paper forms can be a logistical nightmare. Even once the forms are collected, someone needs to manually compile all of the data and transfer it to an excel spreadsheet… which is a tedious process and can take hours to complete. While paper surveys may seem in-expensive, printing costs can be steep depending on how large your event is. When you combine printing costs with the hourly salary of an employee to distribute, collect, and compile the data, the costs can add up quickly. Using an event app can be a great way to collect feedback because (A) attendees can respond in real-time, as soon as a session ends, and (B) all of the data is saved electronically so it’s easy to export. The biggest drawback of using an event app is that they are generally more expensive than the prior two options and collecting feedback is usually not their primary purpose. The quality of the survey feature will vary based on the provider but for the most part it will be pretty basic — for example, attendees simply choose from one of three ‘smiley face’ options (Positive, Neutral, Negative) to rate a session overall — which can limit the usefulness of the data that you collect. What Category Does Conferences i/o Fall under? Conferences i/o is an Audience Response System. Our product is specifically built to facilitate real-time audience interaction, and we only offer three features (Polling, Q&A, Session Evaluations). We believe that Event Apps and Audience Responses Systems serve two very different purposes and we don’t try to compete in the Event App market. Rather than try to be an all-in-one product, we focus on building the world’s best Audience Response System and make it easy to integrate with other event apps. We understand that not everyone can be a customer of Conferences i/o so here are a few things that we’ve learned along the way that can help you improve evaluation response rates from your event… no matter what method you use to collect it. When the attendees are in the session you have their attention but as soon as they walk out the door that control is gone, and you’re now just one of many things fighting for their attention. The battle for their attention multiplies exponentially with every minute that passes, so by the time your survey email hits their inbox two days later it’s going to be pretty low priority on their to-do list. One of the simplest actions that we recommend to all of our customers which has an incredible impact on response rates is to dedicate 1 minute at the end of each session for attendees to provide feedback. This is can be done through a simple announcement by the presenter / moderator but the key is to position it as something that they should be doing RIGHT NOW, before they leave for the next session. It will require a little bit of extra planning / coordination but will result in a DRAMATIC improvement on the amount of feedback that you collect. Collecting real-time feedback can be difficult if you’re using the Post Event Email method but one idea is to setup a few laptop / tablet kiosks around the venue that has the survey (or multiple surveys organized by session) pulled up on the device. One of the advantages of event apps and web-based products like Conferences i/o is that they can be accessed 24/7. While we always recommend trying to persuade attendees to provide real-time feedback, the beauty of these products is that attendees can also access the survey afterwards, if necessary. One additional tip if you are using a product like this — we don’t suggest overly promoting the fact that the survey will still be accessible after the event. Try to position it as something that attendees should do at the end of each session because if they know the survey will be available later, many will procrastinate and end up never responding. If you don’t have access to a product that allows for both real-time and post event feedback then consider using a combination of products / methods. For example; offer paper surveys during the event and send an email with a link to an online survey afterwards. 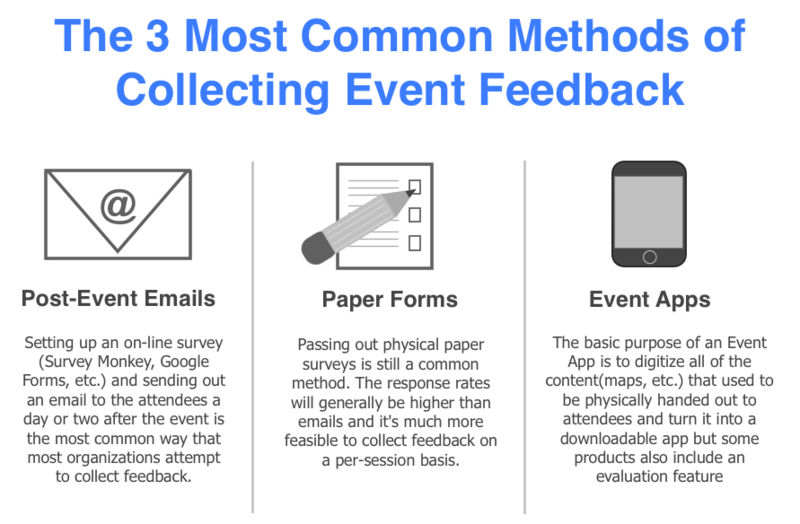 Providing evaluation feedback does not take a lot of work but it’s usually a low priority item for attendees, especially once the event is over. By offering a simple incentive (entered into random drawing for a giftcard, free registration for next year, etc.) your attendees will be much more likely to participate. The incentive doesn’t have to be extravagant but you can expect a fairly direct correlation between the value of the incentive and the amount of participation. If you need proof, look at the Warren Buffet / Quicken Loans Billion Dollar Bracket Challenge — the chances of predicting a perfect March Madness bracket are estimated to be about 1 in 9 Quintillian, yet there will be 15 million people that take the time to enter the contest (which takes much longer than an evaluation survey). Why? Because the incentive is $1 Billion Dollars. No matter what method you use to collect feedback it is critical to make sure that the process is clearly communicated to the attendees. The easier you make it for them, the more feedback you’ll collect. Our customers use an average of ~ 5 questions for session evaluations, which seems to work very well. For overall event evaluations try to aim for somewhere in the 10-15 question range. If you can’t narrow your survey down to shorter than 15 questions, try to include a “status bar” (e.g. shows that they’re on question 5 of 20). Engage Your Audience. Get Started Now! Enter your email and get the very latest from Conferences i/o—monthly tips and insights, team announcements, secret handshakes, and more!